Getting started using Budget Challenge® just got easier with our introductory webinars for teachers! Find out why you want to use Budget Challenge in your classroom and what makes it different from other personal finance programs. This virtual demo provides an overview of the game and demonstrates student and teacher functionality. This one-hour webinar will get teachers oriented to save valuable start-up time and prevent reinventing the wheel. This free and innovative program is best suited for high school classes (grades 9-12) in personal finance, economics, math, marketing, accounting, and family and consumer sciences. Ease the transition to the real world for your students without the overhead of manual simulations. The Road Test for Personal Finance® does the repetitive work for you, so you can focus on content. It even helps with grading! Check out the "What is Budget Challenge®?" video or click here to Learn More. If you are unable to attend one of our live webinars, you can watch a pre-recorded version of it right here. 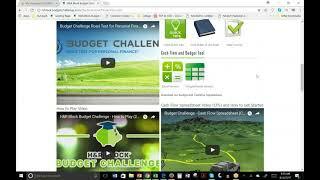 Budget Challenge® is a personal finance simulation that teaches teens money management skills. During the 10-week competition, students receive virtual paychecks and bills in real-time and are challenged to build a budget and make financial decisions that help them learn how to pay bills on time, manage a credit card balance, and save money for retirement in a 401(k). This year H&R Block® is sponsoring high school students to play for FREE and giving away college scholarships to students who excel in the simulation! New teachers may register at hrbds.org and create a class for the spring simulations today! View simulation dates and deadlines. Register today to see why thousands of students and teachers are participating in the H&R Block Budget Challenge! New teachers can register now at www.hrbds.org. Returning teachers use their existing teacher account to login.